The Ottomans introduced a number of unique approaches to governing into the traditions of Islam. Islamic culture did not separate religious and secular matters. At first, the Sultan was the highest power in the land and had control over almost everything. However, a state organization began to take a more definite shape in the first half of the sixteenth century under Suleyman I, also known as "Lawgiver." The Ottomans visualized two separate "establishments" to share state power, one responsible for governing a nation's citizens and the other its military. "The Ottomans left civic control to the civic institutions. Historians often label the Ottoman sociopolitical construct the "Ottoman System. Noteworthy, however, the term "Ottoman System" conveys a sense of structural rigidity that probably was nonexistent throughout the Ottoman period. Armenians occupied important posts within the Ottoman Empire, Artin Dadyan Pasha, who served as minister of foreign affairs from 1876 to 1901, is one of many examples of Armenian citizens who played a fundamental role in the sociopolitical sphere of the Ottoman Empire. After Constantinople fell to the Ottoman Turks in 1453, the patriarchate came to care more directly for all the Orthodox living in the Ottoman Empire. Hovagim I was at the time the Metropolitan of Bursa. In 1461, Hovagim I was brought to Constantinople by Sultan Mehmed II and established as the Armenian Patriarch of Constantinople which the office was created solely with a political purpose. Sultan Mehmed II wanted Armenian-Greek separation. Constantinople become the real center of their ecclesiastical and national life. The Armenian patriarch and not the Catholicos of Etchmiadzin, was their most important national dignitary, as part of Mehmed's wish. In the Sultan's capital, lived the largest Armenian community in the world; and his civil-ecclesiastical authority made the Sultan practically the most powerful official among the Armenians at large. Before the Ottoman conquest in 1453 there were probably no Armenian churches in Constantinople. Since 1453, 55 new Armenian churches were built in Istanbul, some are from the 16th century. Until the promulgation of the Hatt-i Sherif of 1839, the patriarch and his clients, within limits, possessed penal authority over the Armenian people. At the capital the patriarch had his own jail, and maintained a small police force. His authority over his clergy being absolute, he could imprison or exile them at will; and while he was compelled to secure the consent of the Sultan to imprison or exile laymen of his community, the necessary firman was very easily obtained. The patriarchal system of government, in placing civil powers in the hands of high ecclesiastics, was an outcome of the fact that the Sultan made no distinction between church and community, and often lent the weight of its authority to maintain the integrity of the church. In villages, including those of which the population was chiefly Muslim, the Armenian quarters were settled in groups among other parts of the population. Compared to others, Armenians lived in well-built homes. The houses were arranged one above the other, so that the flat roof of the lower house serves as the front yard of the one above it. For safety, the houses were huddled together. Armenian dwellings were adapted to the extremes of temperature in the highlands of Western Armenia (renamed Eastern Anatolia in 1941). In summer the thick walls and earth-covered roofs kept the rooms cool. The natural and agricultural traditions of Armenians were similar to others, but characteristics can also be found in Xenophon, who described many aspects of Armenian village life and hospitality. He related that the people spoke a language that to his ear sounded like the language of the Persians. The Bey or elder was something of a Leader for the village, and his house was typically the most luxurious dwelling in a village. It was not uncommon to have three priests for thirty-five families. Most Armenians traveled on horseback to neighboring villages, sometimes for religious ceremonies (like the Van festival), sometimes to fetch a bride, accompanying her, with musical instruments and clapping of hands, to their own village. It was prohibited to ride a horse or to have weapons for Armenians as giavour, so it was illegal. Aside from the learned professions taught at the schools that had opened throughout the Ottoman Empire, the chief occupations were trade and commerce, industry, and agriculture. The peasants were agriculturists. In the empire Armenians were raised to higher occupations, like Calouste Sarkis Gulbenkian was a businessman and philanthropist. He played a major role in making the petroleum reserves of the Middle East available to Western development. The Armenian Press and literature during this period established institutions that were critical; this attitude has been invaluable in reforming abuses and introducing improvements in Armenian communities. Thus their critical instinct was positive, rather than negative. Armenians organised themselves for different objects; witness their numerous societies, clubs, political parties, and other associations. Hovsep Pushman was a painter who become very famous in the Empire. During this period Armenians would establish a church, a school, a library, and a newspaper. Sargis Mubayeajian was a prolific and multifarious writer educated in Constantinople. Many of his works are still scattered in Armenian periodicals. Many Armenians, who after having emigrated to foreign countries and becoming prosperous there, returned to their native land. Alex Manoogian who became a philanthropist and active member of the Armenian General Benevolent Union was from Ottoman lands (modern Izmir), Arthur Edmund Carewe, born Trebizond, become an actor in the silent film era. Armenians occupied important posts within the Ottoman Empire, Artin Dadyan Pasha served as Minister of foreign affairs of the Ottoman Empire from 1876 to 1901 and is an example that Armenian citizens served the Ottoman Empire. 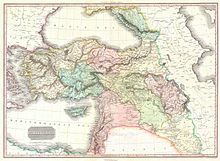 The Eastern Question gained even more traction by the late 1820s, due to the Greek Enlightenment and Greek War of Independence setting an example for making independence against the Ottomans, and along with several countries of the Balkans, frustrated with conditions, had, often with the help of the Powers, broken free of Ottoman rule. The Great Power Imperial Russia stood to benefit from the decline of the Ottoman Empire; on the other hand, Austria and the United Kingdom deemed the preservation of Empire to be in their best interests. The position of France changed several times over the centuries. Armenian involvement on the international stage would have to wait until the Armenian national awakening, which the Armenian Question as used in European history, became commonplace among diplomatic circles and in the popular press after the Congress of Berlin (1878). The Armenian national ideology developed long after the Greek movement. However, the factors contributing to the emergence of Armenian nationalism made the movement far more similar to that of the Greeks than those of other ethnic groups. The three major European powers: Great Britain, France and Russia (known as the Great Powers), took issue with the Empire's treatment of its Christian minorities and increasingly pressured the Ottoman government (also known as the Sublime Porte) to extend equal rights to all its citizens. In 1863, the Armenian National Constitution (Ottoman Turkish:"Nizâmnâme-i Millet-i Ermeniyân") was Ottoman Empire approved. It was a form of the "Code of Regulations" composed of 150 articles drafted by the "Armenian intelligentsia", which defined the powers of Patriarch (a position in the Ottoman Millet) and newly formed "Armenian National Assembly". Mikrtich issued a decree permitting women to have equal votes with men and asking them to take part in all elections. The Armenian National Assembly had wide-ranging functions. Muslim officials were not employed to collect taxes in Armenian villages, but the taxes in all the Armenian villages collected by Armenian tax-gatherers appointed by the Armenian National Assembly. Armenians were allowed to establish their own courts of justice for the purpose of administering justice and conducting litigation between Armenians, and for deciding all questions relating to marriage, divorce, estate, inheritance, etc., appertaining to themselves. Also Armenians were allowed the right to establish their own prisons for the incarceration of offending Armenians, and in no case should an Armenian be imprisoned in an Ottoman prison. Beginning in 1863, education was available to all subjects, as far as funds permitted it. Such education was under the direction of lay committees. During this period in Russian Armenia, the association of the schools with the Church was close, but the same principle obtains. This became a problem for the Russian administration, which peaked during 1897 when Tsar Nicholas appointed the Armenophobic Grigory Sergeyevich Golitsin as governor of Transcaucasia, and Armenian schools, cultural associations, newspapers and libraries were closed. 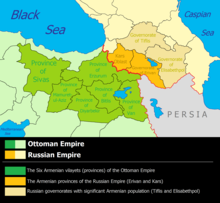 The Armenian Question, as used in European history, became common place among diplomatic circles and in the popular press after the Congress of Berlin (1878); that in like Eastern Question (normally dated to 1774), refers to powers of Europe's involvement to the Armenian subjects of the Ottoman Empire beginning with the Russo-Turkish War of 1877-78. However, in specific terms, the Armenian question refers to the protection and the freedoms of Armenians from their neighboring communities. The "Armenian question" explains the forty years of Armenian-Ottoman history in the context of English, German, Russian politics between 1877 and 1914. Abdul Hamid II was the 34th Sultan and oversaw a period of decline in the power and extent of the Empire, ruling from 31 August 1876 until he was deposed on 27 April 1909. He was the last Ottoman Sultan to rule with absolute power. The Bashkaleh clash was the bloody encounter between the Armenakan Party and the Ottoman Empire in May 1889. Its name comes from Başkale, a border town of Van Eyalet of the Ottoman Empire. The event was important, as it was reflected in main Armenian newspapers as the recovered documents on the Armenakans showed an extensive plot for a national movement. Ottoman officials believed that the men were members of a large revolutionary apparatus and the discussion was reflected on newspapers, (Eastern Express, Oriental Advertiser, Saadet, and Tarik) and the responses were on the Armenian papers. In some Armenian circles, this event was considered as a martyrdom and brought other armed conflicts. The Bashkaleh Resistance was on the Persian border, which the Armenakans were in communication with Armenians in the Persian Empire. The Gugunian Expedition, which followed within the couple months, was an attempt by a small group of Armenian nationalists from the Russian Armenia to launch an armed expedition across the border into the Ottoman Empire in 1890 in support of local Armenians. The first notable battle in the Armenian resistance movement took place in Sassoun, where nationalist ideals were proliferated by Hunchak activists, such as Mihran Damadian and Hampartsoum Boyadjian. The Armenian Revolutionary Federation also played a significant role in arming the people of the region. The Armenians of Sassoun confronted the Ottoman army and Kurdish irregulars at Sassoun, succumbing to superior numbers. This was followed by Zeitun Rebellion (1895–96), which took place between 1891 and 1895, Hunchak activists toured various regions of Cilicia and Zeitun to encourage resistance, and established new branches of the Social Democrat Hunchakian Party. The 1896 Ottoman Bank takeover was perpetrated by an Armenian group armed with pistols, grenades, dynamite and hand-held bombs against the Ottoman Bank in Istanbul. The seizure of the bank lasted 14 hours, resulting in the deaths of 10 of the Armenian men and Ottoman soldiers. The Ottoman reaction to takeover saw further massacres and pogroms of the several thousand Armenians living in Constantinople and Sultan Abdul Hamid II threatening to level the entire building itself. However, intervention on part of the European diplomats in the city managed to persuade the men to give, assigning safe passage to the survivors to France. Despite the level of violence the incident had wrought, the takeover was reported positively in the European press, praising the men for their courage and the objectives they attempted to accomplish. The years between 1894 and 1896 ended, with estimates of the dead ranging from 80,000 to 300,000. The Hamidian massacres are named for Sultan Abdul Hamid II, whose efforts to reinforce the territorial integrity of the embattled Ottoman Empire resulted in the massacres. 6 Armenian provinces of Western Armenia. Patten, William and J.E. Homas, Turkey in Asia, 1903. 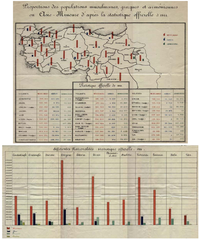 The Armenian reform package declared that the vilayets which Armenians living were to be under an inspectors general, (the map is an archive document of 1914 population statistics). With onslaught of World War I, the Ottoman Empire and Russian Empire engaged during the Caucasus and Persian Campaigns, and the CUP began to look on the Armenians with distrust and suspicion. This was due to the fact that the Russian army contained a contingent of Armenian volunteers. On 24 April 1915, Armenian intellectuals were arrested by Ottoman authorities and, with the Tehcir Law (29 May 1915), eventually a large proportion of Armenians living in Western Armenia perished in what has become known as the Armenian Genocide. There was local Armenian resistance in the region, developed against the activities of the Ottoman Empire. The events of 1915 to 1917 are regarded by Armenians, Western historians, and even some Turkish writers and historians like Taner Akçam and Orhan Pamuk, to have been state-sponsored and planned mass killings, or genocide. ^ Minasyan, Smbat (21 June 2008). "Armenia as Xenophon saw it". Archived from the original on 27 August 2008. Retrieved 3 September 2008. ^ Wolf-Dieter Hütteroth and Volker Höhfeld. Türkei, Darmstadt 2002. pp. 128–132. ^ M. Canard: "Armīniya" in Encyclopaedia of Islam, Leiden 1993. ^ G. L. Selenoy and N. von Seidlitz: "Die Verbreitung der Armenier in der asiatischen Türkei und in Trans-Kaukassien", in: Petermanns Mitteilungen, Gotha 1896. ^ Kaligian, Dikran Mesrob (2009). Armenian Organization and Ideology Under Ottoman Rule: 1908-1914. Transaction Publishers. pp. 30-39–40. ISBN 9781412807753. ^ Cahoon, Ben (2000). "Armenia". WorldStatesmen.org . ^ Johansson, Alice (January 2008). "Return Migration to Armenia" (PDF). Radboud Universiteit. ^ Ter-Minasian, Ruben. Hai Heghapokhakani Me Hishataknere [Memoirs of an Armenian Revolutionary] (Los Angeles, 1952), II, 268–269. ^ Darbinian, op. cit., p. 123; Adjemian, op. cit., p. 7; Varandian, Dashnaktsuthian Patmuthiun, I, 30; Great Britain, Turkey No. 1 (1889), op. cit., Inclosure in no. 95. Extract from the "Eastern Express" of 25 June 1889, pp. 83–84; ibid., no. 102. Sir W. White to the Marquis of Salisbury-(Received 15 July), p. 89; Great Britain, Turkey No. 1 (1890), op. cit., no. 4. Sir W. White to the Marquis of Salisbury-(Received 9 August), p. 4; ibid., Inclosure 1 in no. 4, Colonel Chermside to Sir W. White, p. 4; ibid., Inclosure 2 in no. 4. Vice-Consul Devey to Colonel Chermside, pp. 4–7; ibid., Inclosure 3 in no. 4. M. Patiguian to M. Koulaksizian, pp. 7–9; ibid., Inclosure 4 in no. ^ a b c Creasy, Edward Shepherd. Turkey, pg.500. ^ Kurdoghlian, Mihran (1996). Hayots Badmoutioun, Volume III (in Armenian). Athens, Greece: Hradaragoutioun Azkayin Ousoumnagan Khorhourti. pp. 42–44. ^ Akcam, Taner. A Shameful Act. 2006, pg.42. ^ Kurdoghlian, Mihran (1996). Hayots Badmoutioun, Volume III (in Armenian). Athens, Greece: Hradaragoutioun Azkayin Ousoumnagan Khorhourti. p. 47. ^ Kirakosian, Arman Dzhonovich. The Armenian Massacres, 1894–1896: 1894–1896 : U.S. media testimony, Page 33. ^ a b Kansu, Aykut (1997). The Revolution of 1908 in Turkey. Brill Academic Publishers. p. 78. ISBN 90-04-10283-3. ^ Kurdoghlian, Mihran (1996). Hayots Badmoutioun (Armenian History) (in Armenian). Athens, Greece: Hradaragutiun Azkayin Oosoomnagan Khorhoortee. pp. 52–53.